While most of us buy clothes at the nearest retail stores, some opt to make their own. Armed with a high-quality sewing machine and lots of creativity, these talented individuals can transform pieces of shapeless fabrics into creative clothing masterpieces. It’s not too late though – anyone can learn to make their own clothes along with resourcefulness and passion for what they do. 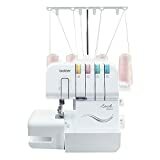 For starters, a serger machine, also known as the “overlock machine”, trims and closes the fabric’s edges so it will look cleaner and free from loose threads. There are actually different thread use options available in serger machines. These include 2 to 4-thread sergers, 3 to 4-thread sergers, and 5-thread sergers. All of these sergers vary on the stitching capabilities and the number of threads it can accommodate. However, a serger machine cannot replace a traditional sewing machine. 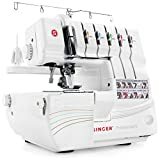 This is because a sewing machine is still required for zippers, buttonholes, and more – which cannot be done by a serger. On a side note, some sewing projects can be done using a serger although not all of them, and also make a piece of clothing durable. Take time to check different sergers in the market. For one thing, using a serger can be a whole new experience, which is why it is important to get the best for you. Aside from that, you should also do some research about how to use it, or take advantage of lessons offered within your vicinity or via online. There are also books that discuss the basics of using a serger, so you may want to use that as well. Weigh in on the sergers’ features and user benefits. As mentioned, sergers vary in thread count, stitch variation, and other functions. That is why it is best to choose the one that will suit your sewing needs. Other sergers also include additional accessories such as a presser foot, retractable blades, and cleaning brushes, to name a few. Also, make sure to check whether the serger machine is easy to set up, use and provide overall positive performance. More importantly, choosing the best sergers should also depend on your budget. Some may range higher, but its features and user benefits can make it worth the price, so make sure to do your own research so you can get the best out of your buck. You can also check out customer reviews online to help decide on your next purchase. The above tips should help you in choosing the Best Sergers for your sewing needs. While sergers may not be a mandatory requirement in sewing, it can be a great start on your sewing journey.